Select 'larger photo' to see sample room scenes. 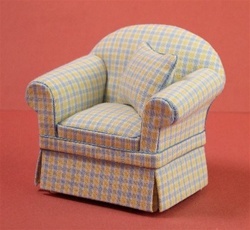 Offered here is a Chair upholstered yellow & blue check fabric. Chair has rolled arms, gently rounded back and skirted bottom with corner pleats and stands on wooden legs. A matching throw pillow is included. Pillows are trimmed with matching trim. 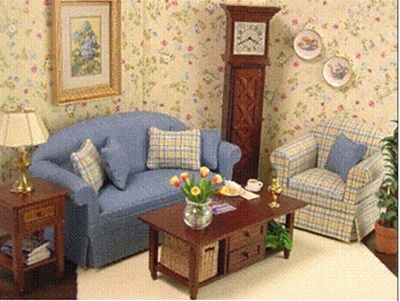 Great in as a matching Yellow & Blue Check set or mix and matched with sofa and chairs of different upholstery. Lee’s Line of upholstered Furniture easily coordinates with styles including Country, Traditional or Contemporary and works casual and formal settings. All fabrics are Limited Edition and limited in availability.